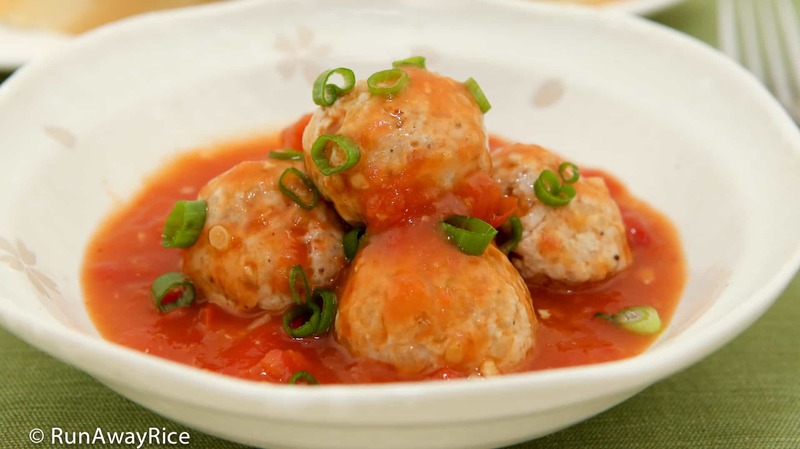 This recipe for Vietnamese Meatballs (Xiu Mai) is a pure comfort-food dish. 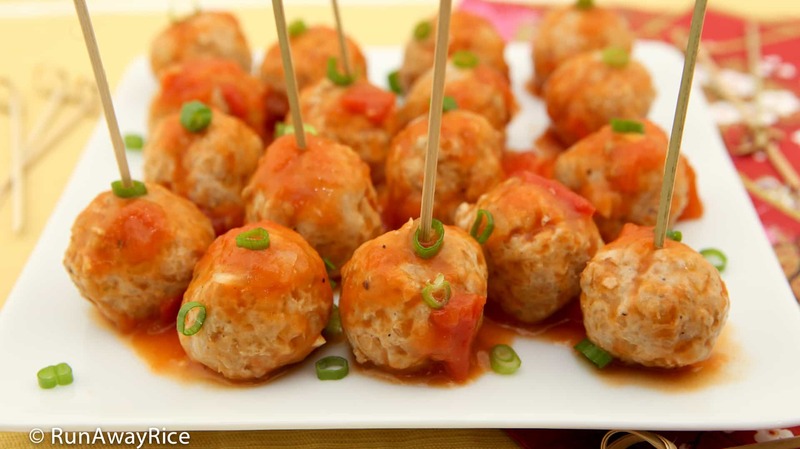 The tender pork meatballs are flavorful and have delicious crunch from the jicama. Cooked in a homemade tomato sauce, these hearty meatballs are absolutely mouth-watering. Super-versatile, the meatballs can be enjoyed for breakfast, as a small meal or an appetizer. Serve the Vietnamese Meatballs with lots of crusty bread for dipping in the zesty sauce. One of my favorite ways to eat the meatballs is as a sandwich. The combination of savory meatballs, crusty sandwich roll, crunchy cucumber, spicy jalapeno, and tart carrot and radish pickles (or carrot and chayote pickles) is so tantalizing. I hope this recipe becomes one of your favorites. Enjoy! For juicier meatballs, use ground pork with some fat in it. An 80/20 mixture is ideal. Optionally, if using lean or extra-lean ground pork, add 1 Tbsp vegetable oil to the meat mixture. If jicama is difficult to find, substitute with canned water chestnuts. Use one 8 oz can for this recipe. Drain the canning liquid and then finely chop the water chestnuts. Avoid over-working the meat mixture as this will make the meatballs tough. Combine the meat mixture just until everything sticks together. Try this recipe with ground chicken, turkey or beef. I often make this with ground chicken and it’s delicious! I like my tomato sauce a bit chunky and so don’t cook the tomatoes long. Feel free to cook the tomatoes longer for a smoother sauce. This recipe is super forgiving so you can make and then simmer on the stove until you’re ready to eat. Adjust the tomato sauce to your preference. If you want a thicker sauce, reduce the water and/or add the corn starch + water mixture. When using the thickener, make sure to cook it adequately or the sauce will taste starchy. Remove the jicama skin using a vegetable peeler. Finely dice the jicama. Cut off the white (root) portion of the green onions and finely chop. Chop the green onion stems. Transfer the green onion stems into a small bowl and set aside for later. In a medium bowl, add the ground pork, jicama, green onion (white) root, garlic, fish sauce, corn starch and ground black pepper. Mix together by hand combining all of the ingredients well. Combine just until everything sticks together. Avoid over-working the meat mixture as this will make the meatballs tough. Using a tablespoon, scoop out some of the meat mixture and transfer to a large plate. Continue making small mounds until all the meat mixture is used. Wet your palms with water to prevent sticking. Gently roll each of the mounds into a ball. Heat a large skillet over Medium High heat and when hot add vegetable oil. Add the minced garlic and tomato paste. Stir fry for 15-20 seconds. Add the chopped tomatoes and combine together. Add the sugar, fish sauce and water. Stir together combining the ingredients. Bring the liquid to a boil. Reduce the heat to Medium Low, cover the pan and cook for 5 minutes. Make room in the center of the skillet by pushing the tomatoes to the side. Gently transfer the meatballs into the sauce. Cover and cook on Medium Low heat for 5 minutes. After this time, rotate the meatballs and cook for another 5 minutes. To make the thickener, mix the corn starch and water until smooth. Add to the sauce. Combine gently and continue cooking for another 2-3 minutes. Top with ground black pepper. 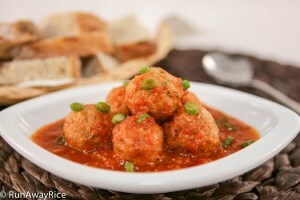 To serve, transfer a few meatballs into a small bowl along with a generous amount of tomato sauce. Top with the chopped green onion stems. 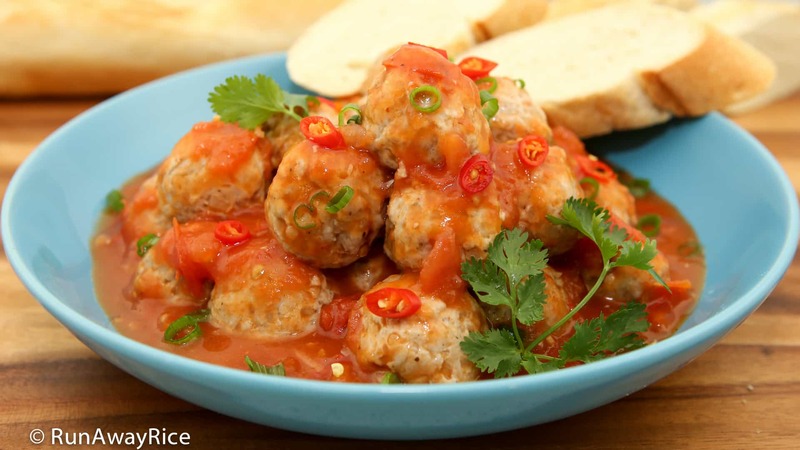 Enjoy these scrumptious Vietnamese Meatballs with crusty bread. 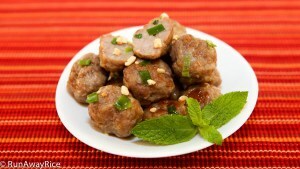 This recipe for Vietnamese Meatballs (Xiu Mai) is a pure comfort-food dish. 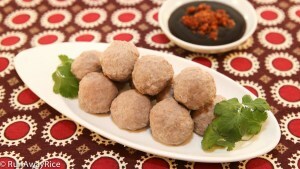 The tender pork meatballs are flavorful and have delicious crunch from the jicama. Cooked in a homemade tomato sauce, these hearty meatballs are absolutely mouth-watering. Super-versatile, the meatballs can be enjoyed for breakfast, as a small meal or appetizer. 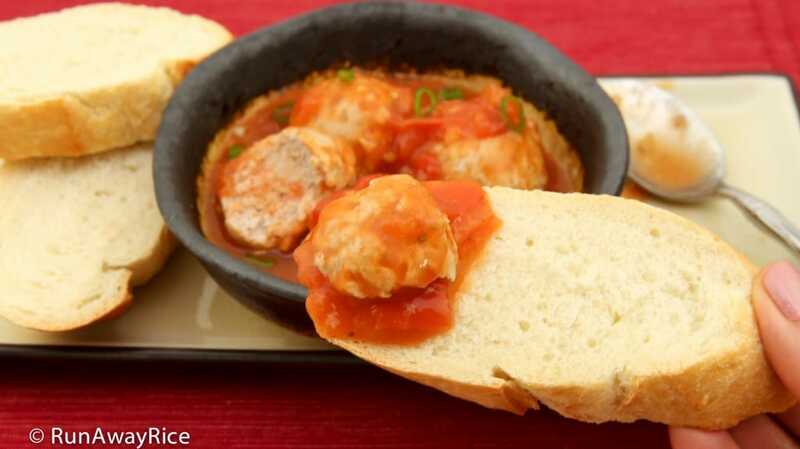 Serve the Vietnamese Meatballs with lots of crusty bread for dipping in the zesty sauce. Enjoy! Avoid over-working the meat mixture as this makes the meatballs tough. Combine the meat mixture just until it sticks together. Try this recipe with ground chicken, turkey or beef. I often make this with ground chicken and it's delicious! I like my tomato sauce a bit chunky and so don't cook the tomatoes long. Feel free to cook the tomatoes longer for a smoother sauce. This recipe is super forgiving so you can make and then simmer on the stove until you're ready to eat. These meatballs make an awesome sandwich. 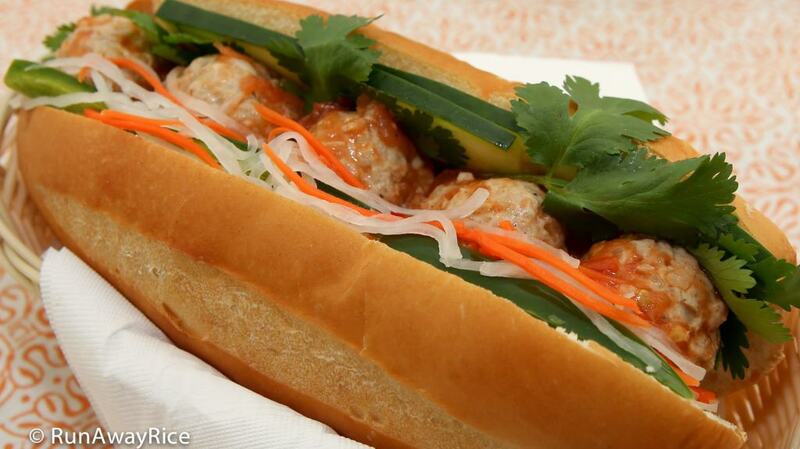 Add sliced cucumber, jalapeno, carrot and radish pickles and cilantro for an amazing banh mi! I’m going to give this a try with lean ground turkey! This simple, easy, tasty recipe is still being used today! Delicious. Changed it a bit just for taste, but this base formula is woooooonderful. Awesome! I am glad to hear you enjoyed the recipe. Definitely adapt and make it your own. Happy Cooking! Fantastic recipe, best meatballs I’ve ever had. Thanks! Made this last night and it was delicious! Thank you! I love your slower cooker recipe for Vietnamese Meatballs and knew this recipe would be just as amazing. My family loved the meatballs and the abundant tomato sauce. Thanks for sharing another easy recipe!